store operations, channel management, order management and business intelligence. 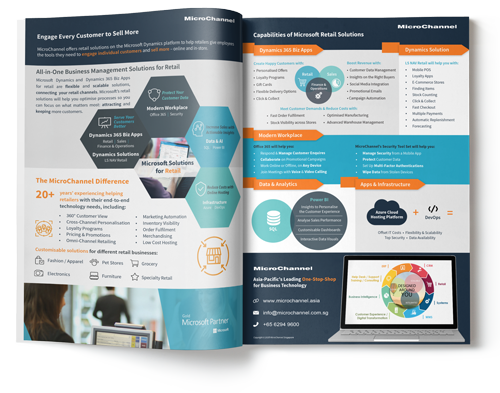 Microsoft Dynamics AX Retail provides customer engagement capabilities that include store operations, channel management, order management, marketing and care, and business intelligence. The solution also includes back office capabilities, procurement and financials, delivering full visibility across the entire business operation. These capabilities can be implemented as a comprehensive end-to-end solution or as individual business functions to complement existing technologies. Microsoft Dynamics AX for Retail provides end-to-end capabilities for retailers of all sizes. The solution offers you flexibility to deploy features according to your requirements – modern POS, store operations, merchandising, e-commerce, call centre, marketing, marketing automation and customer relationship management (CRM), to supply chain and financials. With over 150 retail customers from stand-alone bricks and mortar to large multi-nationals, MicroChannel is your one stop shop for Retail Solutions, E-Commerce, Customer Relationship Management, Marketing Automation, Wholesale and Enterprise Resource Planning. Microsoft Dynamics AX Retail is now also known as Dynamics 365 for Retail, providing the same robust functionalities now on the cloud plus more features. Read more about Dynamics 365 for Retail and take a free trial. Get more information on the end-to-end retail solutions we offer. Detailed fast sheet on the offerings by retail solution by Microsoft Dynamics.